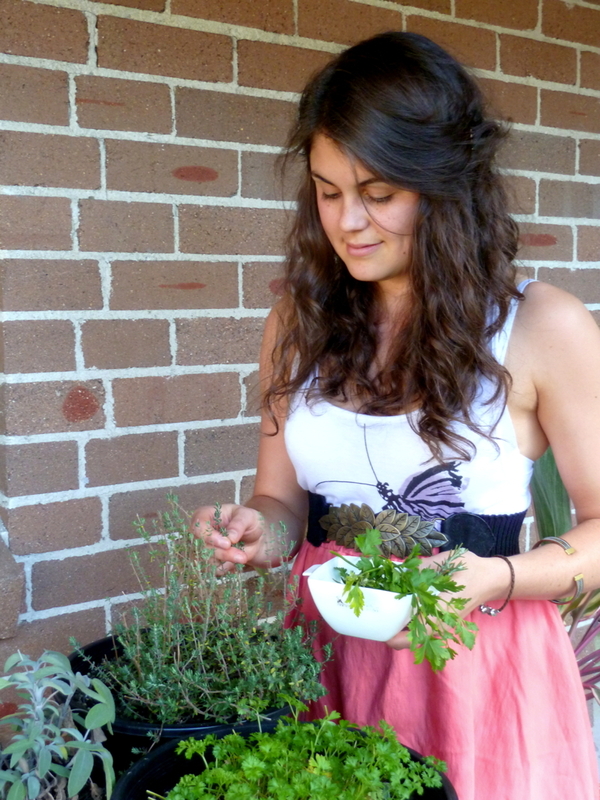 I gain an immense amount of satisfaction from creating healthier versions of much loved recipes. A nutritional makeover. At times I fret over how just happy I become when the transformation is successful. Too happy. Regardless, you can’t deny that being able to eat favourite ‘unhealthy’ dishes more often (because, they’ve been, well, ‘healthified’) is cause for some celebration. The major downside of some ‘healthed-up’ versions is that they are often inaccessible or unappealing to many home cooks, either due to obscure ingredients or lengthy preparation practices. However, you need not be wary of this particular recipe – it’s not overtly brazen at all. 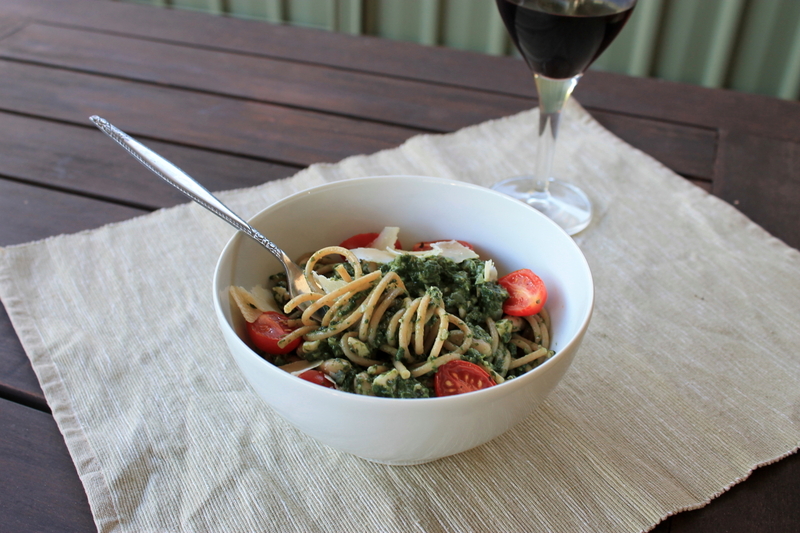 Sweet, juicy roasted tomatoes, creamy pesto and whole-wheat pasta..why it’s virtually a simple weeknight meal! Before my cooking obsession fully took off early last year, I often became frustrated when the recipe I wanted to make called for ‘weird’ items such as rice syrup, buckwheat flour and quinoa flakes. Today those three are firm staples in my pantry as I now prepare more than enough recipes calling for them to warrant it (despite the exxy price tag). Alternatively the recipe would appear too out-there to even consider trying. Regardless of what we like to say, we all have food boundaries that will.not.be.crossed, irrespective of how healthy the recipe is. Tofu cheesecake? Uh-uh. That one’s unlikely to ever happen around these parts. Okay dokey, enough of the mini vent. On to more important matters. Such as this pesto. Those points certainly don’t apply to this baby, so there’s no excuses, none whatsoever, for not giving it a whirl. Crammed with spinach and almonds, you could give Pop-eye a run for his money after eating a bowl of this. Most pestos contain substantial amounts of oil – one of the main reasons that it’s remained on my ‘only to eat rarely’ list. This particular specimen however, contains just one tablespoon. One. And I couldn’t tell the difference, not one bit. By refraining from squeezing out the spinach after wilting it, you have plenty of moisture to produce the required consistency. A dollop or two of natural yoghurt helps it on it’s merry way and simultaneously ups the creaminess generated by the almonds. Experimenting with new ways of sneaking hidden pockets of protein into meals that are lacking in that department is a perpetual mission for vegetarians. Admittedly there’s not a super-duper amount in here, but it’s better than nothing! Don’t fret that it won’t taste like traditional pesto – it still contains a decent handful of basil. You can be quite flexible with the amount of cheese that you use – unless you use bucket-loads it doesn’t significantly alter the texture. I was quite content with a small amount, however the two cheese freaks in our house preferred more…some people. Sheesh. The pesto keeps well in the fridge for at least three or four days (I haven’t tried longer), try using any leftovers to jazz up wraps, sandwiches, salads or quiches. Alternatively, smear on fresh bread (homemade of course) for a super snack. Best thing is, it’s hard to feel guilty about doing so. 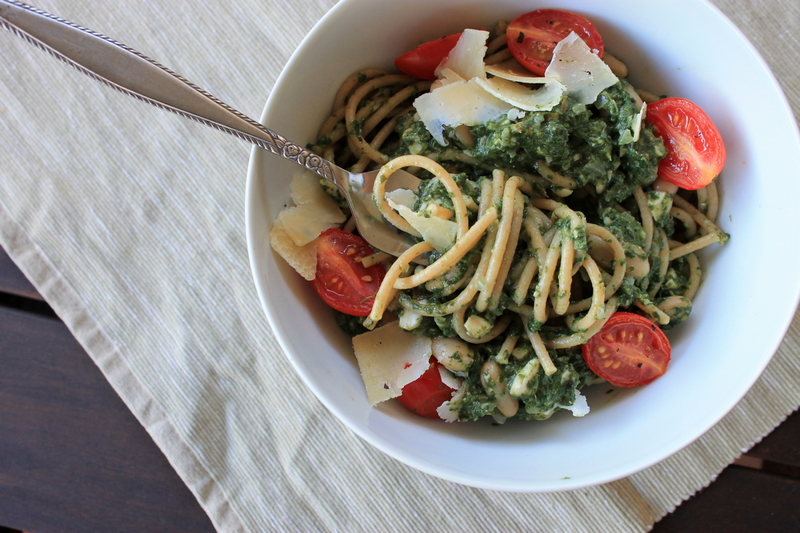 Why, this pesto’s actually good for you! Whole-wheat pasta (spaghetti works particularly well). I use approx.. 50g per person. Preheat oven to 200C. Arrange the cherry tomatoes, cut side up, on a small baking tray. Drizzle with one tablespoon of the olive oil and sprinkle with sea salt and a good grind of black pepper. Set aside. Heat the remaining tablespoon of oil in a large frying pan (ensure that it has a lid) over a medium to high heat. Sweat the onion for 2 minutes or until softened but not coloured. Reduce the heat to medium and add the garlic. Cook for a further 3 minutes, stirring regularly. Rinse the spinach leaves and give them a good shake (don’t pat dry). Pack the spinach into the fry pan, cover and cook for 3 minutes or until beginning to wilt. Remove the lid, stir well and cook for a further 2 minutes. Transfer to a strainer set over a bowl and leave to cool for 15 minutes. While the spinach mixture is cooling, pop the tray of cherry tomatoes in the oven. Roast for 15 min or until beginning to ooze juices. Bring a pot of salted water to the boil and throw in your pasta. Cook according to packet directions or until al dente. Drain. Once the spinach mixture has cooled slightly, throw into a food processor along with the basil, parmesan, almonds and lemon juice. Blitz until smooth, scraping down the sides once or twice. Season well with salt and pepper, whisk through the yoghurt and add more lemon juice if you wish. Return the drained pasta to the frying pan over a low heat, dollop in the pesto and toss in the cannellini beans (if using them). Using a pair of tongs, toss the pasta or twist the spaghetti so that it is well coated in pesto. Once heated through, serve topped with the cherry tomatoes and a side salad/roasted veg if you like.